As the Superfast Spreading Rate Crust 4 expedition comes to a close, it is a good to remember that this expedition is not only one chapter in the story of research on this drill site, it also one chapter in the continuing story of the research conducted by the JOIDES Resolution and other ocean drilling research vessels. To increase student awareness of this, the Deep Earth Academy has a free poster and accompanying activity about the rich and important history of the JOIDES Resolution. The “Legacy of Scientific Ocean Drilling” poster, which is free to educators, is two-sided, with both sides providing educational content. One side contains a timeline detailing some of the history of scientific ocean drilling and the kinds of exciting discoveries that ocean drilling scientists have made over the past 40 years. 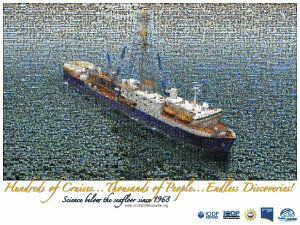 The other side is a mosaic image of the JOIDES Resolution made up of many smaller photos showing the research and operations of the JR. The images of both sides of the poster, which is free, can be viewed here. The free, full-size poster can be ordered by educators here. Also, did I mention it was free? There is also a lesson plan that includes a variety of questions that are like a scavenger hunt that can focus student attention on the various resources to be found on both side of the poster. A pdf of the lesson plan can be downloaded from the Deep Earth Academy website here.